Since, 2001, Marla Martenson’s skills have led many couples to matrimony. Using her own personal dating experiences, she was able to help others and turned that talent into a career matchmaking in Los Angeles. In addition to being a dating and relationship coach and Beverly Hills matchmaker, she is also a professional speaker and bestselling author. Named the “Over 40 Female of the Week” in February, 2010, for Over40Females.com, she writes for online publication such as Cougar Candy Store, Commitment, Examiner and Absolutely Fabulous Women. Marla is the bestselling author of Excuse Me, Your Soul Mate Is Waiting, Good Date, Bad Date, and Diary of a Beverly Hills Matchmaker. She has appeared on NBC’s Today Show, WGN Chicago Morning News, the Cooper Lawrence Show, and Urban Rush, to name a few. 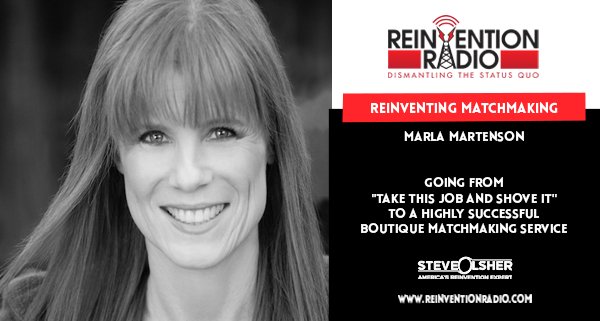 TUNE IN to this episode to hear Marla talk with Steve and Mary about how she went from “Take this Job and Shove It” during the 2009 recession to having a highly successful boutique matchmaking service.